After playing through Don’t Escape: 4 Days in a Wasteland, it reminded me of the good old days of point and click adventures, such as Broken Sword, Discworld, Escape from Monkey Island and the like, back to when I was a kid, playing these classics on my PS1. I’ve not felt that excitement in quite a long time with having detailed stories lovingly crafted, epic puzzles to solve and using my brains to solve them (or the latest magazine to help me with hints as internet wasn’t really a thing back then). 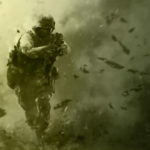 Written and developed by Scriptwelder and published by Armor Games Studios, this post-apocalyptic tale of survival has just recently been released on the 11th March 2019. This tale sees you playing as David in a world that’s about to end. With nothing but your ingenuity and your wits, can you survive four days in the wasteland? I certainly gave it it a good go. Here’s how I got on. When you start on this adventure, you don’t know what’s happening. All you do know is that the world is coming to an end in four days. David, the main character you play as, is left wandering the wasteland, finding anything he can to help him survive. On your adventure, you happen upon an abandoned house. No signs of residents in sight, and all the land surrounding it left derelict. Here is where your story truly begins. At the beginning of each day, you’ll have a dream that will foresee the day’s events later that evening. 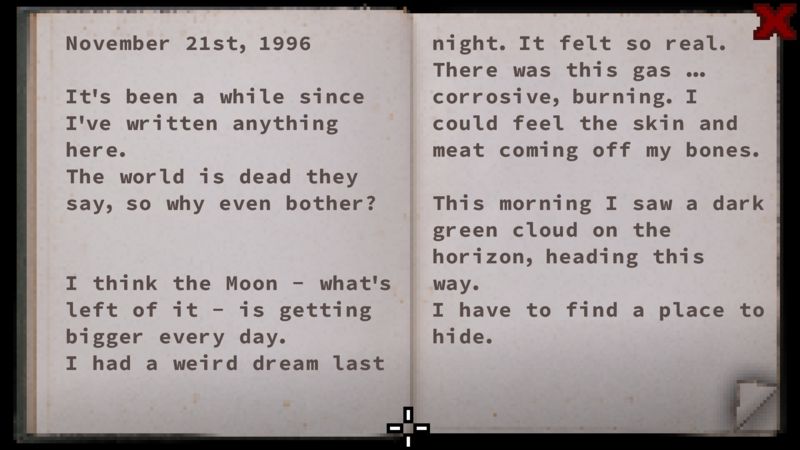 In my playthrough, I had quite a variety of events to deal with, though I won’t tell you all of them as that will spoil them. 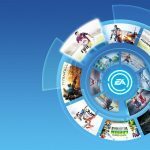 Remember, you can play this game multiple times as there will be a different set of events, making coming back to play Don’t Escape such a blast. As an example, I had a night where gas was enveloping the wasteland, destroying anything in its path with the high levels of toxicity it contained. In order to overcome this challenge, I had to explore the surrounding areas on my map to see what I could find to help fortify my newly acquired shelter. As previously mentioned, each day has a new challenge waiting for you, and how you go about dealing with it is entirely up to you. You can wander around until the time runs out. You could gather supplies to help with your defences for said day’s events. Play it however you wish. But, all of this runs parallel to the time management game mechanic that lies at the heart of this tale. Everything you do/don’t do will cost you time. Sure, you may find supplies to help with your home, but it may cost you an hour to clear out debris first. Not managing your time wisely can be your Achilles heel. 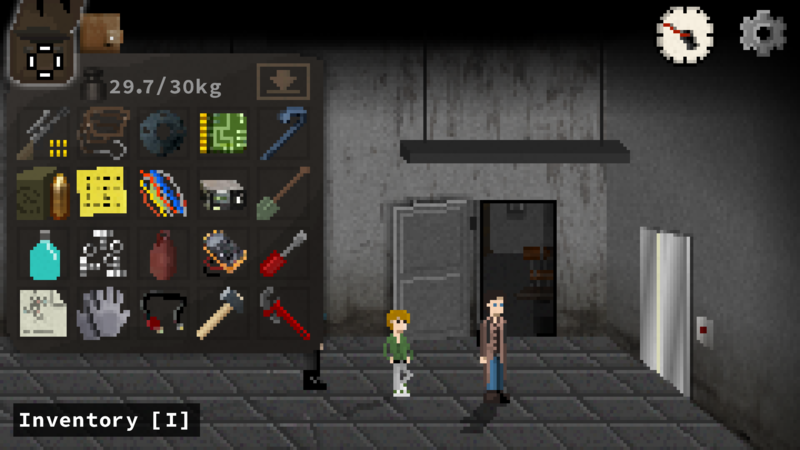 In pretty much every post-apocalyptic scenario, the ability to scrounge for supplies and manage them will be key to helping you survive, and it’s no different with Don’t Escape. The main character has a certain number of spaces and a limit to his carrying capacity. So, the ability to pick everything up all at once is straight out of the window. Deciding what you want to take versus what you NEED to take is essential as it could be the difference between life or death. Now, you do get help in the form of chests within your shelter, but again, spaces are limited. The other option would be to leave them on the floor (even though I didn’t try this, it is a viable option). 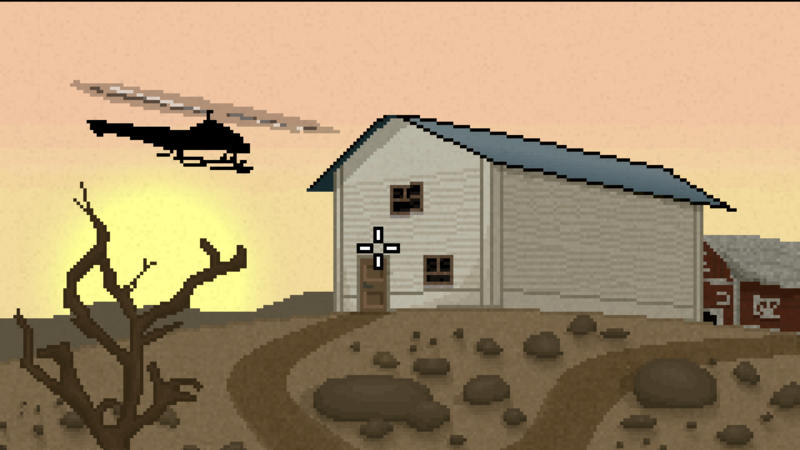 Many items can be combined for different scenarios to solve whilst traversing the wasteland. It is, however, up to you to figure them out. There is no hand-holding here. Every puzzle will need to be solved the good old fashioned way: by sleuthing through and figuring it out as you go, which, believe me, is what I’m still doing on day four. I just can’t for the life of me figure out this puzzle I’m stuck on. Reminds me of the Broken Sword days being stuck in the Irish pub (I still can’t figure it out). As with many of Scriptwelder’s other games, there is a certain visual style to Don’t Escape that has stood out to me, that being its pixelated art. I love this type of game where the imagination can run riot. That, coupled with an eerie soundtrack, made me really feel like I was in the Apocalypse with David. Every heartfelt decision was weighed carefully. 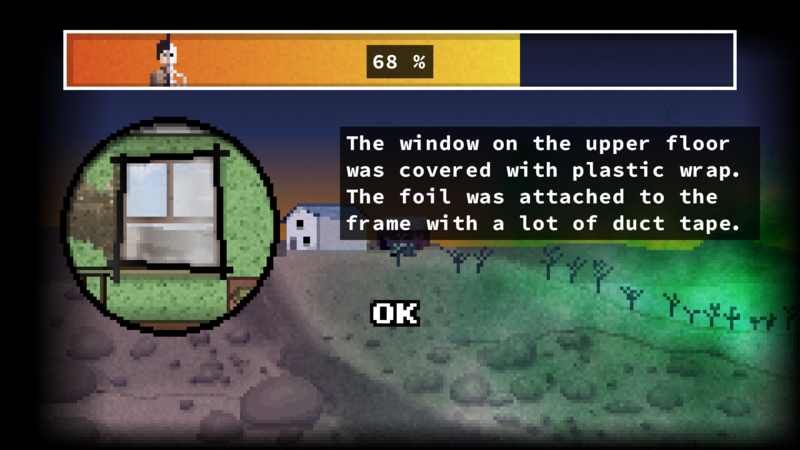 There’s something that draws me in whilst I’m playing Don’t Escape: 4 Days in a Wasteland. Even when meeting other characters along your journey, they don’t feel two-dimensional; they have their own opinions, their own agendas and how they interact with each other is expectant of an end of the world scenario. In retrospect, looking back at my time playing this title, I seriously cannot find anything bad to say about it, other than if you get truly stuck and can’t continue. Like me. 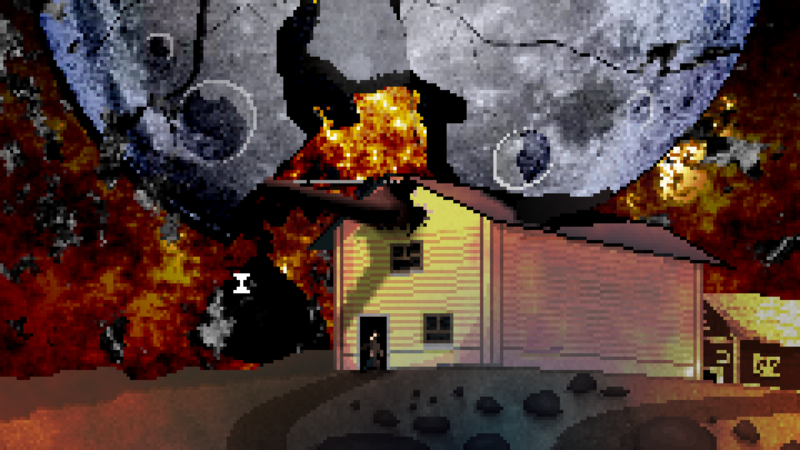 But, this game will keep fans of the point and click genre satisfied. It has all the charms of a retro-styled game and has the human elements that make any good story work on multiple levels. The puzzles are engaging, and the longevity will have players retrying the story to see what new scenarios they can encounter. Oh, and check out the other titles from Scriptwelder HERE. I know i’m going to play the back catalogue in the coming weeks. 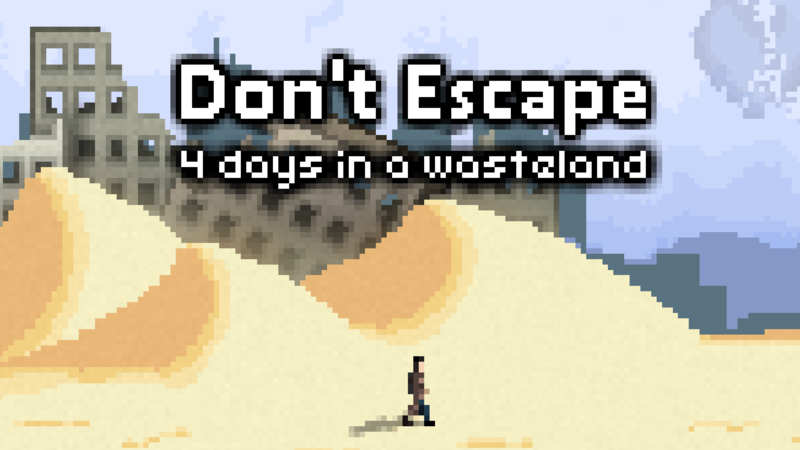 Don't Escape: 4 Days in a Wasteland is an engaging story told in a pixelated art style about the end of days. It has complex characters that engage well with each other and challenging scenarios that will have you guessing at how best to maximise your time to see how your defenses hold up to what the end of days throws at you. An enjoyable journey from start to finish (well, as enjoyable as an apocalypse can be, I suppose). Thoroughly recommend it.